http://soundcloud.com/sonicsneakers/sonic-cd-cc-pre The new link and update for my Collision Chaos remix. Are sonic-inspired original songs also accepted? http://www.newgrounds.com/audio/listen/423886 TrickyWolfy's and my first collab. Is this album material too? http://www.newground...o/listen/476694 Would this be acceptable? And perhaps these? http://www.newgrounds.com/audio/listen/437188 http://www.newgrounds.com/audio/listen/476195 and please don't forget to credit me as "sonicsneakers" and NOT FireGXLOL :] thank you. 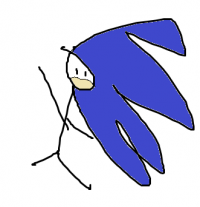 sonicsneakers is the name i go under when publishing remixes of stuff from Sonic games. FireGXLOL is a youtube account i used for non remix related material, and while it may seem silly, several artists go under different names depending on the projects. Calling me Jesse would be fine as well. "FireGXLOL" here, finally. But we can stop calling me that as i have an artist name i go by "sonicsneakers" hence why my soundcloud has that name. http://soundcloud.co...on-chaos-good-f Something i'm working on in my spare time. Needs transitions, background effects, and all the bells and whistles. I'll post when i've made an update. If only they had an upgrade that increases the length of the homing attack. The default length is pathetic. Wtf? It's almost as short as Sonic Adventure 1. I've compared a boostless homing attack in unleashed to a regular homing attack in generations and you go WAY farther in unleashed. In generations it just doesn't launch you far enough to reach some of the platforms. HOPEFULLY theres a skill to increase homing attack distance. EDIT on behalf of avoiding a double post: Also, why does the homing attack cause you to lose all momentum? It's a serious speed killer! It wasn't like that in any other sonic game so, why this one? Weird! I'm not hating, i just think that the homing attack in this game is just a little screwy. I rather enjoyed the double jump in colors. As a music creator, i've posted a few of my works to this site before. I'm currently working with a very talented animator on a birthday animation for Sonic, and in between labor hours i had a little conversation with Jun Senoue. There were a lot of cases where he didn't really understand me, and where i didn't really understand him, but it's a pretty entertaining read for those who are bored. Good suggestion! I'll do that from now on! =) It's my dream to one day be featured on a sonic fansite for my incredible music feats XD hey even Crush40 themselves, or at least their admins gave me a thumbs up on my accomplishments. Okay =P This is totally awesome. I made it as a tribute to another user, but the song needs to be heard! http://www.youtube.com/watch?v=-XtkhMR8pT8 Tell me what you guys think! Crush40 Acknowledges a Cover Band!